Today, a life without nanotechnology is hard to imagine. Nanotechnologies – to be more specific: nanomaterials – are already used in numerous products and industrial applications. 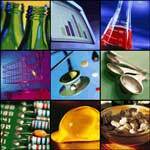 Our Nanotechnology Products and Applications database already provides an overview of how nanomaterials and nanostructuring applications are used today in industrial and commercial appplications across industries (please note: This is NOT a consumer products database that you can find elsewhere; so no antibacterial socks, bathroom cleaners, face creams, or pet products here...). Our section "Ten things you should know about nanotechnology" provides you with an excellent first overview of what nanotechnologies are, what they are used for, and what some of the key issues are. If you want to get a more in-depth view of nanotechnology in important industry areas, then this section is for you. Also check out our primer How does nanotechnology work? 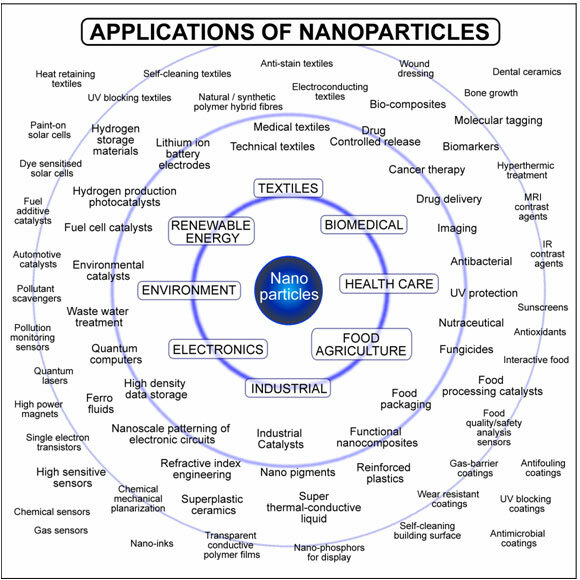 Here is a brief overview of some current applications of nanomaterials. Most of them represent evolutionary developments of existing technologies: for example, the reduction in size of electronics devices. They also give us an idea where nanotechnology will take us and where nanotechnology can be used in the future. An important use of nanoparticles and nanotubes is in composites, materials that combine one or more separate components and which are designed to exhibit overall the best properties of each component. This multi-functionality applies not only to mechanical properties, but extends to optical, electrical and magnetic ones. Currently, carbon fibres and bundles of multi-walled CNTs are used in polymers to control or enhance conductivity, with applications such as antistatic packaging. The use of individual CNTs in composites is a potential long-term application. A particular type of nanocomposite is where nanoparticles act as fillers in a matrix; for example, carbon black used as a filler to reinforce car tyres. However, particles of carbon black can range from tens to hundreds of nanometres in size, so not all carbon black falls within our definition of nanoparticles. Clays containing naturally occurring nanoparticles have long been important as construction materials and are undergoing continuous improvement. Clay particle based composites – containing plastics and nano-sized flakes of clay – are also finding applications such as use in car bumpers. Coatings with thickness controlled at the nano- or atomic scale have been in routine production for some time, for example in molecular beam epitaxy or metal oxide chemical vapor deposition for optoelectonic devices, or in catalytically active and chemically functionalized surfaces. Recently developed applications include the self-cleaning window, which is coated in highly activated titanium dioxide, engineered to be highly hydrophobic (water repellent) and antibacterial, and coatings based on nanoparticulate oxides that catalytically destroy chemical agents. Wear and scratch-resistant hard coatings are significantly improved by nanoscale intermediate layers (or multilayers) between the hard outer layer and the substrate material. The intermediate layers give good bonding and graded matching of elastic and thermal properties, thus improving adhesion. A range of enhanced textiles, such as breathable, waterproof and stainresistant fabrics, have been enabled by the improved control of porosity at the nanoscale and surface roughness in a variety of polymers and inorganics. Cutting tools made of nanocrystalline materials, such as tungsten carbide, tantalum carbide and titanium carbide, are more wear and erosion-resistant, and last longer than their conventional (large-grained) counterparts. They are finding applications in the drills used to bore holes in circuit boards. Incorporating nanoparticles in paints could improve their performance, for example by making them lighter and giving them different properties. Thinner paint coatings (‘lightweighting’), used for example on aircraft, would reduce their weight, which could be beneficial to the environment. However, the whole life cycle of the aircraft needs to be considered before overall benefits can be claimed. It may also be possible to substantially reduce solvent content of paints, with resulting environmental benefits. New types of foulingresistant marine paint could be developed and are urgently needed as alternatives to tributyl tin (TBT), now that the ecological impacts of TBT have been recognised. Anti-fouling surface treatment is also valuable in process applications such as heat exchange, where it could lead to energy savings. If they can be produced at sufficiently low cost, fouling-resistant coatings could be used in routine duties such as piping for domestic and industrial water systems. It remains speculation whether very effective anti-fouling coatings could reduce the use of biocides, including chlorine. Other novel, and more long-term, applications for nanoparticles might lie in paints that change colour in response to change in temperature or chemical environment, or paints that have reduced infra-red absorptivity and so reduce heat loss. Concerns about the health and environmental impacts of nanoparticles may require the need for the durability and abrasion behaviour of nano-engineered paints and coatings to be addressed, so that abrasion products take the form of coarse or microscopic agglomerates rather than individual nanoparticles. Nanospheres of inorganic materials could be used as lubricants, in essence by acting as nanosized ‘ball bearings’. The controlled shape is claimed to make them more durable than conventional solid lubricants and wear additives. Whether the increased financial and resource cost of producing them is offset by the longer service life of lubricants and parts remains to be investigated. It is also claimed that these nanoparticles reduce friction between metal surfaces, particularly at high normal loads. If so, they should find their first applications in high-performance engines and drivers; this could include the energy sector as well as transport. There is a further claim that this type of lubricant is effective even if the metal surfaces are not highly smooth. Again, the benefits of reduced cost and resource input for machining must be compared against production of nanolubricants. In all these applications, the particles would be dispersed in a conventional liquid lubricant; design of the lubricant system must therefore include measures to contain and manage waste. Source: "Commercial scale production of inorganic nanoparticles"